Metal Hammer bjuder på en trevlig intervju med Paul, ett utdrag från artikeln nedan. KISS have been the godfathers of good-time rock for 35 years. Having unleashed their best album in years, they’re still not ready to hang up their platform boots. Paul Stanley explains how they’re showing the pretenders how it’s done. Paul Stanley is a man in perpetual motion. At 57, he and his bandmates in KISS are days away from the next leg of the group’s seemingly never-ending Alive 35 tour, and he’s so consumed with last-minute details that he had to postpone our initial interview in Los Angeles to focus on rehearsals before catching a flight to Detroit, where the band will kick off the tour. Later, relaxing in the band’s Motor City hotel, KISS’s venerable guitarist and vocalist takes a moment to reflect on the group’s recent record-breaking concert tallies. Their terrific year will end with another milestone — the release of Sonic Boom, the band’s first studio effort since 1998’s Psycho Circus, an album that neither their fans nor KISS themselves recall all that fondly. Paul may be intensely busy dealing with tour and album logistics, but his spirits are high as he looks to the future as well as to the group’s past. 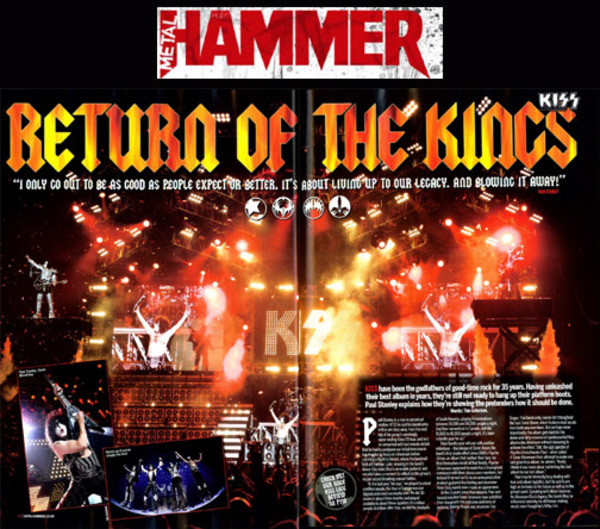 Speaking with Metal Hammer, he discusses KISS’s legacy the bands they’ve influenced and why he still keeps making music even though he’s filthy rich. It’s been 11 years since KISS’s last record. Why did you decide that now was the right time for a new album? What do you say to people who contend that Sonic Boom can’t be a classic KISS album if it doesn’t have the classic KISS lineup with Ace Frehley and Peter Criss? How did Tommy Thayer and Eric Singer contribute to Sonic Boom? You said last year you wouldn’t make another KISS album unless you ”could do it the way I wanted to do it.” How did that play out with Sonic Boom? Gene was reluctant about making a new album too, complaining about illegal downloading. How did you deal with that issue? This album came together pretty quickly, right? Because you’ve got a fanbase that spans generations, how do you decide who your audience is? Is Sonic Boom used to lure in new fans or a gift for people who’ve stuck with you? So many bands have been influenced by KISS – like Marilyn Manson, Immortal, and Rammstein. What do you think of these bands that pay homage to you? A lot of newer bands don’t have the showmanship that you guys bring. Why do you think that is? What about younger bands? Do you go out on tour thinking that you want to school them on how it’s done? So you don’t feel you have to compete with other groups? Other artists like Motley Crue and Ozzy Osbourne have headlined festival tours with bands that are clearly influenced by them. Does a KISS festival appeal? KISS finally got nominated for induction into the Rock and Roll Hall of Fame. How did you feel when you heard the news? You said that you’re only competing with yourself. But isn’t that daunting? That legacy is a lot to live up to. It sounds like you’re a guy who really appreciates where the band is at this stage of their career.